If it wasn't for Intel's marketing goons, these could have been the best CPUs in history. Awesome, even so. Note: This Intel Core i5-2500K review also reviews the Sandy Bridge architecture as a whole, as well as the high-end Intel Core i7-2600K processor. Ready or not, here they come. Intel is rolling out a thoroughly overhauled range of PC processors based on its new Sandy Bridge microarchitecture. Our first taste of the new chips comes in the form of the Intel Core i5-2500K and Intel Core i7-2600K desktop CPUs. Thanks to the baffling array of chips, sockets and brands, we've barely got to grips with Intel's existing CPU range. Certainly Intel's main rival, AMD, has no answer in outright performance terms to the chips Intel already offers, but the relentless march of technology must go on. So, ignore the familiar Core i5 and Core i7 branding. These are all new processors and they're ready to roll. As it happens, Intel could actually do with more powerful and, crucially, more power efficient processors for laptop PCs. Deep down, that's what Sandy Bridge is really about. However, as we'll learn, Sandy Bridge has a lot to offer for the desktop, too, including exciting new features such as a hardware video transcoding engine and much-improved integrated graphics. At launch, it's not quite a full range of processors. In total, Intel is rolling out 14 new desktop CPUs based on Sandy Bridge under the Core i3, Core i5 and Core i7 brands. Pricing extends from around £75 to £250. The very top and bottom of Intel's desktop range will remain unchanged. The six-core Gulftown derivative of the Core i7 and the entry-level Pentium chips live on for now. Everything else is effectively for the chop. With new chips inevitably come new chipsets, but what you might not expect is the new processor socket. Known as LGA1155, it's almost identical to the existing LGA1156. It loses just one pin. Problem is, the two sockets are entirely incompatible. You cannot drop Sandy Bridge processors into any existing motherboard. Nor can you use any previous Intel processors with Sandy Bridge-supporting motherboards. Although Intel will absolutely deny it, we believe this change in sockets is unlikely to have been a technical necessity. Instead, at best, we suspect it represents a disregard for existing customers, and at worst a tactic designed to force whole a platform upgrade rather than drop-in CPU changes. Unfortunately, the new socket isn't the only dubious new feature that debuts with Sandy Bridge. Intel has also made a fundamental change to the chip's architecture that has killed traditional processor overclocking using the CPU bus stone dead. We'll come to the details later, but the bottom line is that Intel has brought overclocking under strict control. It's not completely gone, but it's only available where and when Intel allows it. However, don't let those negatives convince you the new Intel Core i5-2500K and Intel Core i7-2600K chips are stinkers. 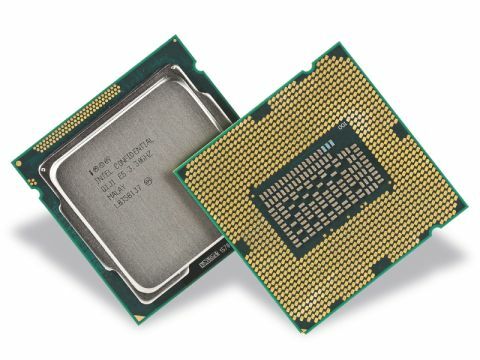 Compared to their closest equivalents from Intel's existing range – the Intel Core i5-760 and Intel Core i7-870 – the new chips are arguably in a different league. In fact, even the mighty six-core Core i7 980X isn't safe from Intel's remarkable new Sandy Bridge architecture. It's that good.